Floyd Mayweather has enjoyed a flawless professional career that has seen him retiring with a perfect 49-0 record, proving to be a master in the boxing ring over the years – a master of defence that has rarely been rocked in his entire career. He beat fighters such as Manny Pacquiao, Oscar De La Hoya, Shane Mosley, Juan Manuel Marquez and Ricky Hatton during his career. The bookmakers have installed Mayweather as the 1/5 favourite but Coral Sportsbook is offering a HUGE 25/1 price boost for Mayweather to beat McGregor! Find below all the deatils and claim the monster price as soon as you can! Join Coral from now until toouching gloves for 25/1 Floyd Mayweather to win against Conor McGregor on August 26th instead of 1/5 - It's a massive price boost!! Coral are offering all BetAndSkill readers an amazing 25/1 for Floyd Mayweather to beat Conor McGregor, click this link to get your exclusive offer in two simple steps. Open a new Coral online or mobile account and bet on Mayweather to beat McGregor 25/1. 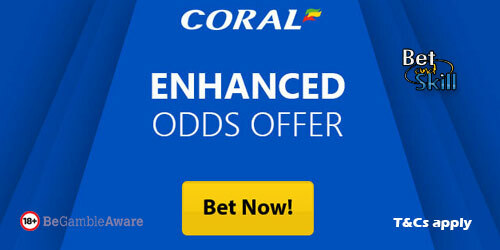 Offer available to UK & Republic of Ireland residents aged 18 years or over opening a new Online, Mobile or Coral Connect account in either £/€ currency through https://promotions.coral.co.uk/landing-pages/crazy-prices, https://promotions.coral.co.uk/landing-pages/crazy-prices-online, or the specific offer promotion box from coral.co.uk/sports/offers between 08:00 BST Friday 28/07/2017 until 04:00 BST Sunday 27/08/2017 with the exception of new accounts depositing funds with Moneybookers, Paysafe, Neteller or Skrill. Place your FIRST real money bet as a win single £/€1 on ‘Mayweather to win 25/1’ in our “My Markets” sections. "Back 25/1 Mayweather to beat McGregor at Coral + £5 free bet"